It seems like the weather in certain parts of the world is going crazy. I mean door handles being frozen and all? As much as I keep hoping that it would eventually snow in Singapore, I should be grateful that it actually never snows over here. The good thing about Miss sunshine always being present is that you get to enjoy all types of cold desserts. One of the best things to eat on a hot and humid day is this Delicious Mango Orange Sago. Creamy and chewy, sweet with a bit of zing from the oranges; got to love the layers of texture and flavours! The original dessert actually uses pomelo instead of oranges but pomelo is really not something you can get all year round where else it is really easy to get oranges thus I made that small change in the recipe. The pairing however still works beautifully. I mean come on, it’s oranges and mangoes! This is a popular dessert especially in Chinese Restaurants. 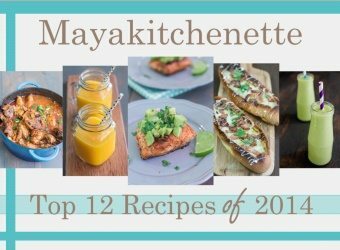 I have been making it for about 10 years now and it is still a hit with my family members. It is the Chinese New Year period over here in Singapore so basically you can see oranges literally everywhere as the Chinese believes that oranges symbolize continuous prosperity and abundance of good fortune so they would always bring along oranges to houses that they visit. In-fact our neighbors would give us oranges too! 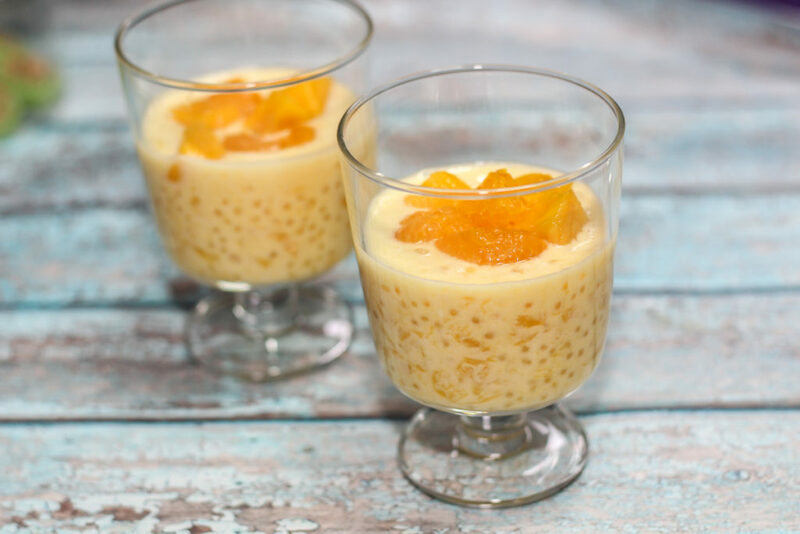 Anyways this Delicious Mango Orange Sago is such a refreshing treat to prepare. Milk is added to give this dessert a creamy consistency. You can use fresh milk or even evaporated milk if you want the dessert to be richer. Cream is also used to make it richer but feel free to omit it, specially if you are conscious of the calories. The type of mangoes used would determine the final taste of the dessert, so it is best to use sweet and ripe mangoes. This way, you would also be using less sugar. With regards to the oranges, you can use either fresh or canned oranges. If you are using canned oranges, make sure you use good quality ones. It makes a lot of difference as some canned oranges can be bitter! If I am using canned, I prefer to use canned mandarin oranges. 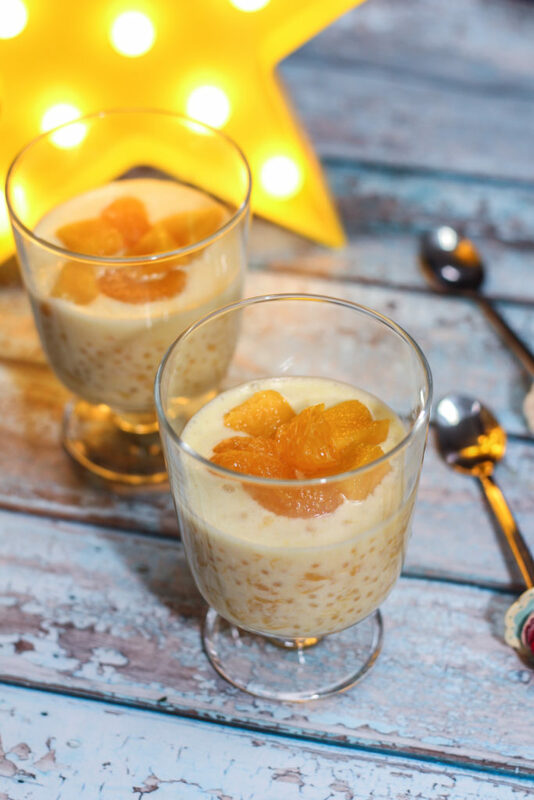 Join my club and give this Delicious Mango Orange Sago dessert a try. 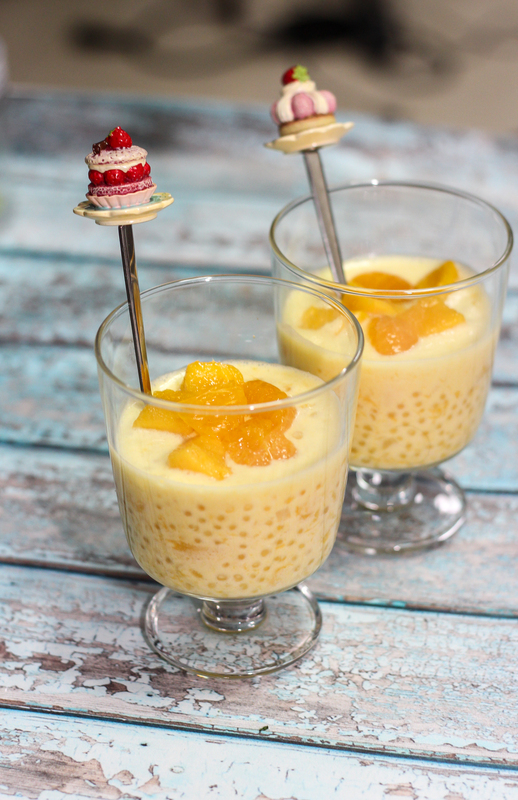 Chewy sago pearls + orange and mango chunks in a creamy velvety sauce. You might just want to sign up for a lifetime membership in this club!! Place half of the mango cubes, sugar and the mango juice in a blender. Blend till smooth. In a bowl, place pureed mango, milk and whipping cream. Leave this mango sauce in the fridge to cool. Pour into a sieve and give the sago a quick rinse. Drain the sago and add it into the bowl of mango sauce. Add the oranges and mango. Cover the bowl with a cling wrap and let it cool in the fridge till ready to serve. I made this Mango Orange Sago Desert and it was awesome! My family loved it and I can forsee myself making this more often.